Preston, Richard A.. "Military Service Act". The Canadian Encyclopedia, 24 July 2017, Historica Canada. https://www.thecanadianencyclopedia.ca/en/article/military-service-act. Accessed 20 April 2019. ​The Military Service Act of 1917 was a controversial law allowing the conscription of Canadian men for service in the final years of the First World War. 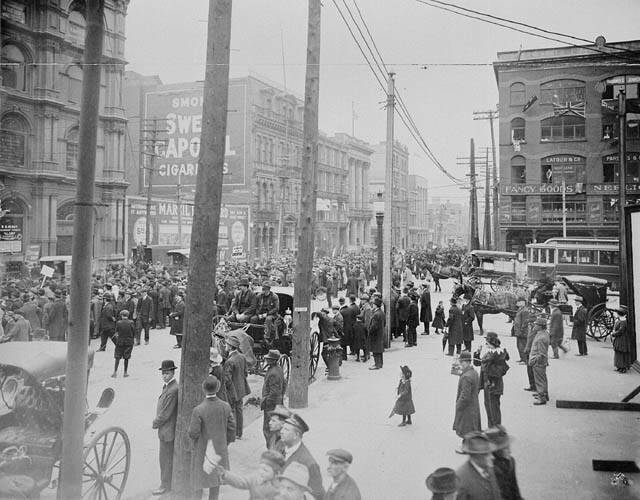 The Military Service Act of 1917 was a controversial law allowing the conscription of Canadian men for service in the final years of the First World War. Although politically explosive, the Act had questionable military value: only 24,132 conscripted men made it to the battlefields of the Western Front, compared to the more than 400,000 who volunteered throughout the war. 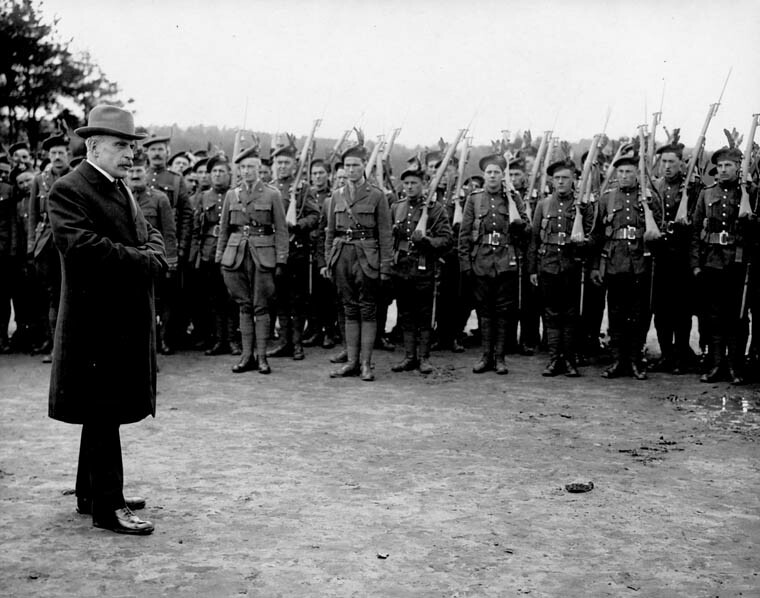 Prime Minister Robert Borden reviews troops on the Western Front in 1917. 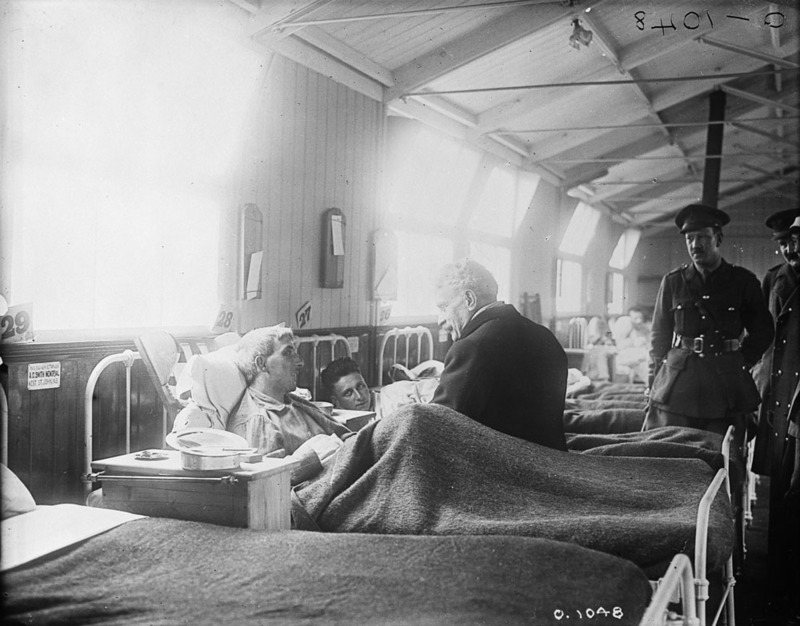 Prime Minister Robert Borden speaks to wounded troops at a hospital in France, during the First World War in 1917. 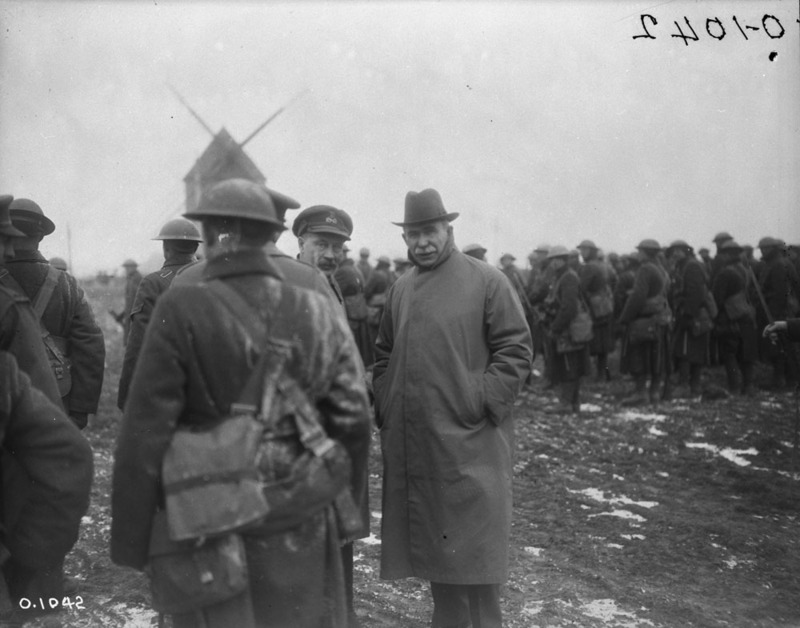 Prime Minister Robert Borden visits the Western Front during the First World War in 1917. More than 300,000 Canadians signed up to fight overseas in the early years (1914–1915) of the First World War, a huge number for a country of only eight million people. By the end of 1916, however, volunteering had nearly dried up. Canada did not have enough recruits to reinforce the Canadian Expeditionary Force, whose numbers were being depleted by the awful toll of the fighting in France and Belgium. 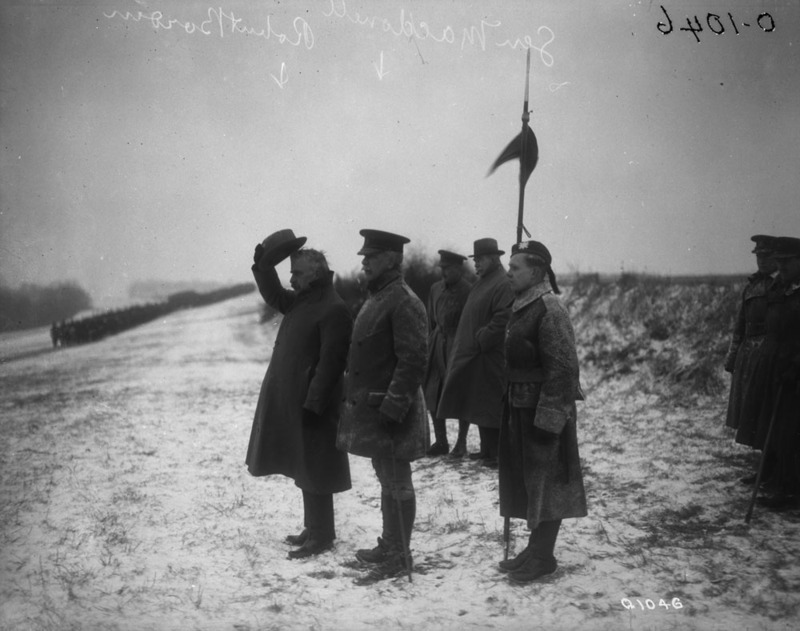 After returning from a visit to France in the spring of 1917, Prime Minister Robert Borden — shocked by the enormity of the struggle, and determined that Canada should play a significant role in the war — announced that compulsory service would be necessary. Anti-conscription rally in Victoria Square, Montréal, Quebec on May 24th, 1917. Image: Library and Archives Canada/C-006859. The debate over conscription consumed and divided the country. Although some French Canadians supported it and some English Canadians did not, for the most part English Canada backed Borden on conscription. His opponents were primarily farmers (who disliked the recruitment of their labouring sons), trade unionists, non-British immigrants, pacifists, and most of French Canada including almost every French-speaking Member of Parliament. Riots over the issue broke out in Québec, where support for the war had always been lukewarm. Liberal Opposition Leader Wilfrid Laurier refused to endorse Borden's call for a unified, coalition government on the matter. Still, Borden managed to push the Military Service Act through Parliament, and it became law on 29 August 1917. It made all male citizens aged 20 to 45 subject to call-up for military service, through the end of the war. "If we do not pass this measure," Borden had told Parliament, "if we do not provide reinforcements, if we do not keep our plighted faith, with what countenance shall we meet (the soldiers) on their return?" A few weeks later, in preparation for a federal election, Borden cobbled together a Union Government made up largely of English-speaking Conservatives, Liberals and independents. The general election of December that year was fought on the issue of conscription — a bitter contest that the Unionists won, receiving a large House of Commons majority. The Act was unevenly administered, and there were numerous evasions by called-up recruits, and many exemptions granted. Thousands of young men refused to even register for the selection process. Of those that did register, 93 per cent asked for exemptions. Call-ups began in January 1918. Of the roughly 400,000 men who registered for conscription, about 100,000 were actually drafted. Of those, only 24,132 served on the front lines in Europe. Although the number of conscript soldiers was small – compared to the 425,000 Canadians who served overseas throughout the war – conscripts were vital in bolstering the depleted divisions of the Canadian Corps during the final, important battles of 1918. Ultimately, the Act's military value was questionable, but its political consequences are clear. It led to the creation of Borden's Union Government, and drove most of his French Canadian supporters into opposition, as they were seriously alienated by this attempt to enforce their participation in what they considered an imperial war. More broadly, the conscription crisis bitterly divided the country along French–English lines. Military Service Act, 1917: important notice An archived copy of a public notice about the Military Service Act, 1917 from the Toronto Public Library. Conscription, 1917An article about the introduction of conscription, a measure that polarized the nation during the First World War. From the Canadian War Museum. ConscriptionScroll through copies of front page news stories about the introduction of conscription in Canada. From vimyridgehistory.com. Quebec’s conscription crisis divided French and English CanadaAn article that describes the lasting impact of the 1917-18 conscription crisis on relations between English and French Canadians. From canada.com. B.C.’s Louie brothersA feature about B.C.’s Louie brothers, who, in spite of ongoing racial discrimination at home, were among 300 Chinese-Canadians who fought in the First World War. From canada.com. Thousands VolunteerAn article about the federal government’s uneven track record concerning Aboriginals who served in the First World War. From Veterans Affairs Canada. Blood and the Ballot: Democracy on HoldA brief documentary about the divisive and bitter federal election of 1917 that centred on the conscription issue. From CPAC.